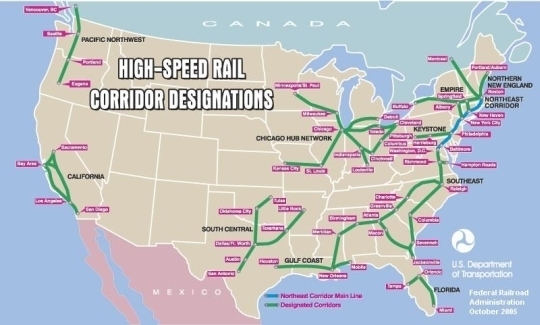 This (geo)graphic was generated by the Federal Railroad Administration. This map conveys some genius on the part of the DoT folks. $8Billion for high speed rail in the Stimulus Plan after idle conversation on the topic for the past 2 decades, which will establish enormous latent demand for more rail. They will pay for Atlanta and Savannah to Jacksonville, and Orlando to Tampa and Miami. But, they will not pay for Jacksonville to Orlando. I wonder how long that will last. And, Houston is connected to New Orleans, but not Dallas, Austin or San Antonio. Nice. What strikes me is how good maps can be at communicating the cataclysmic nature of a single dead zone (see my earlier blogpost on the subject of the Gulf of Mexico Dead Zone), yet how bad they are at communicating the global scale and scope of the problem. I’m afraid red, orange and blue circles simply fail us. The map above simply does not strike me as a 60,000 rail car bad situation. And, having circles sized to represent the scale of the dead zones would simply show a bunch of blobs at a global scale. I’m concerned that emerging global calamities simply cannot be conveyed cartographically, in a single global map. I am happy to be wrong on this, but I haven’t seen it. Unless we move to some other way of conveying the geographic extent, adjacency, and severity of such problems, it will be difficult to inspire collective action. This (geo)graphic was posted on Younes Noorollahi’s website. As I continue to read about Iran’s putative quest for nuclear weapons amid their claims that nuclear simply offers a reliable civilian energy source, Google, as always, sent me in an interesting direction. 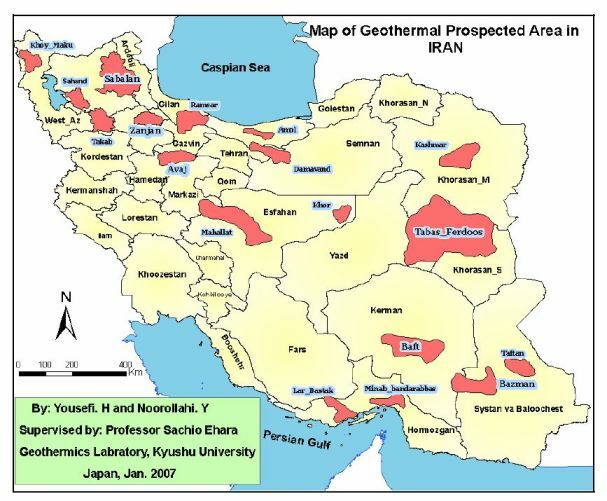 Iran, and interestingly also Afghanistan, sits atop considerable geothermal potential. It turns out that Younes attended the United Nations University Geothermal Training Program in Iceland. I spent my summer vacation in Iceland and was stunned by the power (forgive the pun) of their use of geothermal. Perhaps Younes is onto something. Iran has an Office of Modern Energies and appears to already recognize the potential in geothermal. If we were to have a robust dialog with Iran regarding their energy needs, I would hope that it would encompass geothermal. God knows that Iceland needs some new economic opportunities. Perhaps we could help Iceland help Iran help the rest of us not have to worry about nuclear proliferation when there are clearly already one too many global crises. The Himalyan Geothermal Belt already generates some serious Megawatts. This could definitely change the landscape and dialog with Iran, as well as Afghanistan. Tell Al Gore that Food Matters! 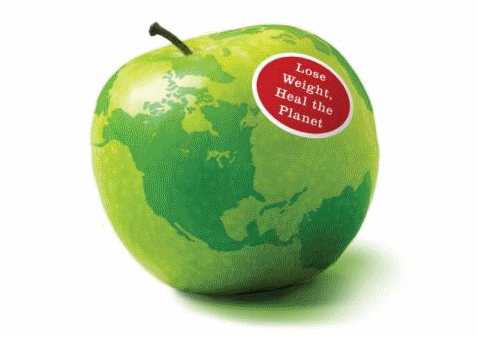 This (geo)graphic was pulled directly off the cover of Mark Bittman’s new book “Food Matters”. It is of an unknown spatial reference system. For those of you who found Michael Pollan’s “Omnivore’s Dilemma” very insightful, but less than actionable, you will like Mark Bittman’s new book “Food Matters”. It does a good job of describing the impacts of our food consumption on our Planet (Earth), from global warming to transmogrified landscapes due to the ever growing demand for meat, and other animal-derived food products. I think many (including myself) never think about how the supply chain behind animal-derived product consumption has completely reshaped the Earth over the past half century. Not to mention how it has reshaped the labor markets associated with food production (see Eric Schlosser’s “Fast Food Nation” for more on that topic). As for “Food Matters”, there is a nice FORA.TV Video Podcast with Bittman talking about the origins of his book (did I mention that I have become addicted to FORA.TV?). He references a UN report entitled “Livestock’s Long Shadow” which addresses the impacts of our animal-derived food chain on the Earth, a report which is very interesting. But, his summary zingers in the Podcast (and the book) really drive home the point. He really makes you ask yourself why you are eating so many animal products (remember, milk and eggs are also products of animals – which are kept no more humanely than those primarily raised to be slaughtered for their meat, and which have a huge impact on the Earth). And, whether we could reduce the amount of animal products by 10 or 20% percent – which would have a massive impact on greenhouse gases. Unfortunately, Bittman did not focus his point on overpopulation, which I still see as the major challenge. The number of domesticated animals impacting the Earth is directly tied to the number of people consuming animal products in their daily meals. While Bittman is correct that we (us First Worlders) all could consume less and live more healthy lives, as we succeed at bringing people worldwide out of poverty, their tastes will begin to mimic ours – only ballooning the existing population of domesticated animals (the US processes 10 billion animals a year). So, I am happy to follow Bittman’s cookbook. But, if everyone on Earth ate that well, our planet would collapse from ecological devastation and accellerated global warming. Which Half of the Earth?